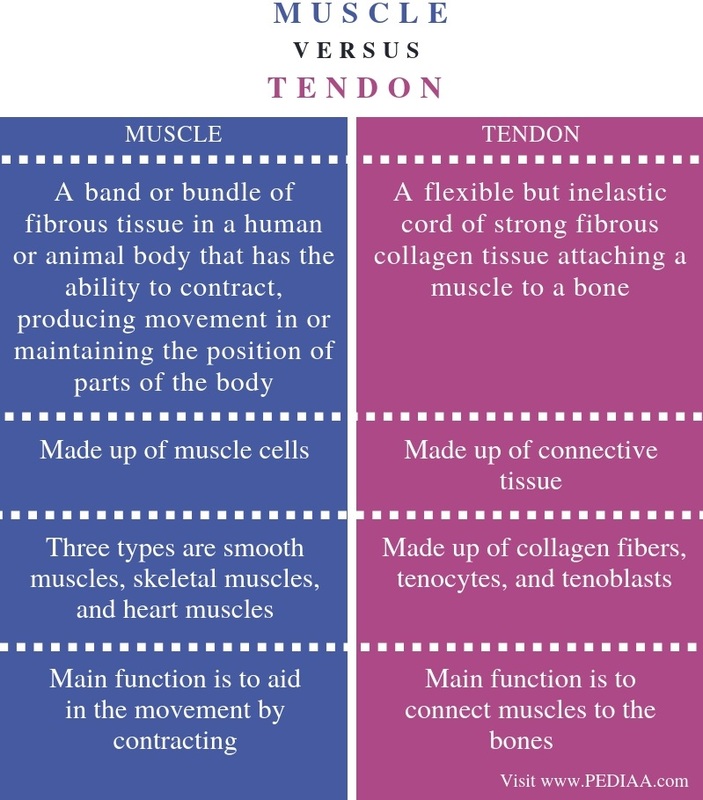 The main difference between muscle and tendon is that the muscle is a bundle of fibrous tissue made up of muscle cells whereas the tendon is an inelastic cord made up of connective tissue. Muscle and tendon are two anatomical structures of the body, which give support to the body while aiding movement. Furthermore, the main function of a muscle is to aid in the movement by contracting while tendon attaches muscles to the bones. Muscle is a fibrous tissue made up of muscle cells. The three types of muscles in the body are the smooth muscles, skeletal muscles, and the heart muscles. The structure,function, and the nerve innervation of the three types of muscle cells differ based on the type. Smooth muscles – This is a type of involuntary muscles responsible for the movements of the internal organs. Smooth muscle cells are single cells with tapering ends. They contain a single nucleus. Moreover, they occur in the lining of the internal organs and are responsible for breathing, digestion, urination, etc. Skeletal muscles – This is a type of voluntary muscles attached to the bones responsible for the physical movement of the body including walking, running, writing, etc. Skeletal muscle cells are very long, cylindrical cells, which are multinucleated. Also, they are striated. Cardiac muscles – This is a type of involuntary muscles responsible for the movement of the heart. Heart muscle cells are a branching chain of cells connected together by porous, intercalated disks. These cells contain a single nucleus. Additionally, the movement of the heart muscles is responsible for pumping blood throughout the body. A tendon is a tough cord which connects muscles to the bones. It is made up of dense, white fibrous connective tissue. This connective tissue mainly contains collagen fibers. The basic unit of a tendon is the primary collagen fiber. A bunch of primary collagen fibers makes up the primary fiber bundle called subfascicle. A group of subfascicles forms the secondary fiber bundle called a fascicle. Several fascicles make up a tertiary fiber bundle called the tendon unit. A connective tissue layer called endotenon covers each primary, secondary, and tertiary fiber bundles. The epitenon is the connective tissue layer which covers the tertiary fiber bundle. Moreover, there are two types of cells in the tendon: tenocytes, the mature cells originating from fibrocytes, and tenoblasts, the immature cells originating from fibroblasts. Tenocytes occur attached to the collagen fibers while tenoblasts occur in clusters, secreting collagen and extracellular matrix of the connective tissue. The main function of a tendon is to transmit the forces exerted by the muscles to the bones. Therefore, tendons occur at each end of a muscle. Due to the high tensile strength of a tendon, it can withstand the great pressure generated on it by the muscle. Muscle and tendon are two types of anatomical structures that provide support to the body. On the other hand, they are important for the movement of the body. Muscle refers to a band or bundle of fibrous tissue in a human or animal body that has the ability to contract, producing movement in or maintaining the position of parts of the body. A tendon refers to a flexible but inelastic cord of strong fibrous collagen tissue attaching a muscle to a bone. Thus, this explains the basic difference between muscle and tendon. Another difference between muscle and tendon is that muscles are made up of muscle cells while tendon is made up of connective tissue. The three types of muscles are smooth muscles, skeletal muscles, and heart muscles while a tendon is made up of collagen fibers, tenocytes, and tenoblasts. The main function of muscles is to aid in the movement by contracting while that of tendon is to connect muscles to the bones. Hence, this is another major difference between muscle and tendon. In brief, muscle is an anatomical structure of the body responsible for the movement of the body. The three types of muscles in the body are smooth muscles, which are responsible for the internal movement of the organs, skeletal muscles, which are responsible for the physical movement, and heart muscles, which are responsible for the pumping of the blood by the heart. On the other hand, a tendon is a type of dense connective tissue that contains collagen. It connects muscles to the bones, transferring the forces generated by the muscles to the bones. Therefore, the main difference between muscle and tendon is their structure and function.